NEW 11 Feb 2011: To celebrate the 60-day countdown to the Blu-ray and DVD release of the blockbuster film ?Harry Potter and the Deathly Hallows – Part 1,? Emma Watson, who plays Hermione Granger, announced yesterday that 100 Limited Edition Blu-rays will be given away via the Harry Potter UK page on Facebook. The specially created Limited Editions will only be available to fans entering the promotion through the Harry Potter UK page on Facebook. 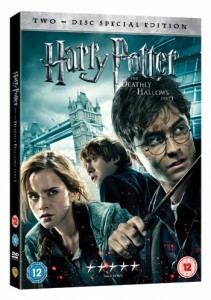 Harry Potter and the Deathly Hallows – Part 1 is released on DVD and Blu-ray on April 11th 2011. Harry Potter and the Deathly Hallows, the seventh and final adventure in the Harry Potter film series, is a motion picture event, told in two full-length parts. Part 1 begins as Harry, Ron and Hermione set out on their perilous mission to track down and destroy the Horcruxes?the keys to Voldemort?s immortality. On their own, without the guidance or protection of their professors, the three friends must now rely on one another more than ever. But there are Dark Forces in their midst that threaten to tear them apart. Meanwhile, the Wizarding world has become a dangerous place for all enemies of the Dark Lord. The long-feared war has begun and Voldemort?s Death Eaters seize control of the Ministry of Magic and even Hogwarts, terrorizing and arresting anyone who might oppose them. But the one prize they still seek is the one most valuable to Voldemort: Harry Potter. The Chosen One has become the hunted one as Voldemort?s followers look for Harry with orders to bring him to the Dark Lord?alive. Harry?s only hope is to find the Horcruxes before Voldemort finds him. But as he searches for clues, he uncovers an old and almost forgotten tale?the legend of the Deathly Hallows. And if the legend turns out to be true, it could give Voldemort the ultimate power he seeks. Little does Harry know that his future has already been decided by his past when, on that fateful day, he became ?the Boy Who Lived.? No longer just a boy, Harry Potter is drawing ever closer to the task for which he has been preparing since the day he first stepped into Hogwarts: the ultimate battle with Voldemort. Warner Bros. Pictures presents a Heyday Films Production, a David Yates Film, ?Harry Potter and the Deathly Hallows ? Part 1,? beginning the last chapter of the most successful motion picture franchise of all time. Heading the cast, Daniel Radcliffe, Rupert Grint and Emma Watson reprise the roles of Harry Potter, Ron Weasley and Hermione Granger. The film?s ensemble cast also includes Helena Bonham Carter, Robbie Coltrane, Ralph Fiennes, Michael Gambon, Brendan Gleeson, Richard Griffiths, John Hurt, Rhys Ifans, Jason Isaacs, Bill Nighy, Alan Rickman, Fiona Shaw, Timothy Spall, Imelda Staunton, David Thewlis, Warwick Davis, Tom Felton, Toby Jones, David Legeno, Simon McBurney, Helen McCrory, Nick Moran, Peter Mullen, David O?Hara, Cl?mence Po?sy, Natalia Tena, Julie Walters, Mark Williams and Bonnie Wright. ?Harry Potter and the Deathly Hallows ? Part 1? was directed by David Yates, who also helmed ?Harry Potter and the Order of the Phoenix? and ?Harry Potter and the Half-Blood Prince.? David Heyman, the producer of all of the Harry Potter films, again produced the film, together with David Barron and J.K. Rowling. Steve Kloves adapted the screenplay, based on the novel by J.K. Rowling. Lionel Wigram is the executive producer, with John Trehy and Tim Lewis serving as co-producers. Behind the scenes, the creative team was led by director of photography Eduardo Serra, production designer Stuart Craig, editor Mark Day, composer Alexandre Desplat, visual effects supervisor Tim Burke, and costume designer Jany Temime. Concurrently with its theatrical release, the film will be released in select IMAX? theatres. ?Harry Potter and the Deathly Hallows ? Part 1? has been digitally re-mastered into the unparalleled image and sound quality of The IMAX Experience? through proprietary IMAX DMR? technology. With crystal clear images, laser-aligned digital sound and maximized field of view, IMAX provides the world?s most immersive movie experience.